I was tired yesterday afternoon. BabyC was whining. My mental to-do list seemed just as long as it was at the start of the day, but I could tell BabyC wasn’t interested in helping me cross anything from it. I glanced at the clock. 4:00 PM. Is it bedtime yet? I wished I could snuggle BabyC in my bed and take a nap with her, but that’s not what she had in mind. The sun was shining, so I figured we should get out and enjoy it. That would at least ensure that BabyC would be happy to see her bed by 7:00 PM. “BabyC, do you want to go for a walk with me?” I asked. She nodded an enthusiastic yes. “OK, let’s get our socks and shoes on so we can go outside!” She shook her head “no” and said, “na-na-na.” It took some negotiations, but 10 minutes later, we were finally headed out. Note to self (once again): never bring only one pair of socks and shoes to the toddler negotiation table. Since we’re talking toddlers here, you know that “going for a walk” is a loose term. My toddler doesn’t walk with any destination in mind. She takes it one step at a time, and every step or so, there is something that must be investigated. My toddler is a scientist, after all. She observes. She asks questions (furrowed brow). She forms hypotheses. She experiments. This is serious work. Like most scientists, she knows that the joy is in the process. If she had only the destination in mind, she would surely miss something along the way. The scientific process is what she does all day, every day. It is how she learns. I would like to make it around one block, including cutting through a meadow where BabyC can play in the grass and the dog can run for a few minutes. But BabyC is busy collecting mulch from the neighbor’s garden. She fills both hands but then realizes that she would like to hold mine. She shakes out one hand, then reaches up to wrap it around my finger. We toddle forward. One step. Two steps. She lets go and squats to get a closer look at something. Hmmm, a spent seed pod. It’s light and a little squishy. She shoves it into her hand with the mulch. We carry on, one step at a time, stopping to investigate everything that catches her eye. Rocks. Lots of rocks. Some loose and some embedded in the sidewalk. Some small and some just a little bigger. Some rough and some smooth. The head of a steel nail just visible in the asphalt of the street, surrounded by an indentation filled with dirt and soot. She circles it with her finger, tracing the path around the nail. Dirt and soot are now under her fingernails. All things that I probably would have missed if I had strapped BabyC in her stroller and taken the walk at my pace. 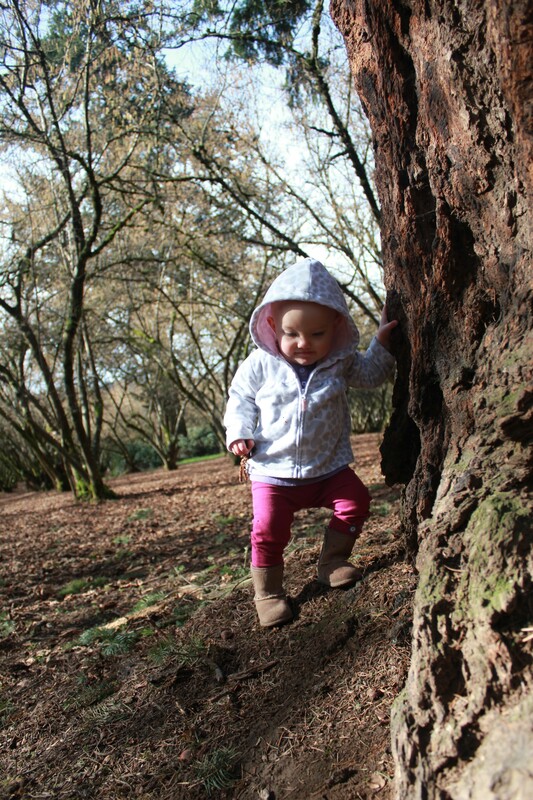 In the meadow, there are stumps which BabyC must try to climb. There is wild, overgrown grass, and she needs lie down in it to see how that feels. While she is down there, there are more seed pods and more dirt to check out, plus some dried grass to pull. I get a little cold and impatient, so we practice marching, tip-toeing, stomping, and dancing, across the meadow and back home. It was worth the struggle to get her shoes on. When I feel tired or impatient or like I have a bazillion things that I can’t seem to accomplish against the inertia of life with a toddler, sometimes it helps to let go and let BabyC get her work done. I know she was satisfied with her afternoon, and that slow meandering walk was a good break for me, too. Best of all, it reminded me how truly joyful science can be when the scientist is able to tinker away in her lab, following one question to the next. My job is to nurture her curiosity rather than let it be squelched under the weight of my to-do list. These photos are from a few days ago, on a different scientific expedition – this one at a local park and historic hazelnut orchard. Something catches her eye – something I surely would have missed. 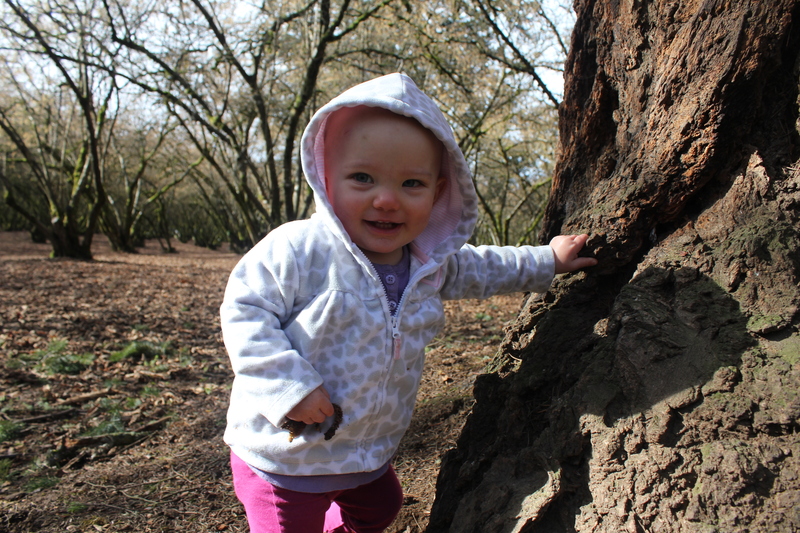 I wonder if BabyC realizes this redwood is a tree, just like the smaller hazelnut trees all around her? It must seem like a wall to her. Carefully navigating a steep down-climb. I love the look of concentration on her face here. I LOVE your words and photos here! I came to your post via a link from Lisa Sunbury on Facebook. Your described exactly what our days have been consisting of during this mild winter (we are in Northern Ca)… my 17 month old has mostly given up on her stroller and I have given up trying to put her in it for walks. There are times when I’d really like a good walk, but I too, remind myself her toddling around and exploring is so much more valuable to her. I can get my walk in later when my husband comes home (or try to anyway). Watching her pick up each leaf, examine the various rocks and sticks we come across… collect acorns… is almost spiritual for me, to watch her connect nature and science. Also as a side note, we had a man in a grocery store line once comment on her eyes, “she has the eyes of a scientist”. My husband and I were so delighting by his refreshing compliment over the usual “she is so cute”, etc. I will never forget how that made me feel, and it really sparked something in me to appreciate her observations and the wonder she finds around her. Thank you again! What a beautiful reminder that the whole world is brand new to toddlers and that it is their job to explore it. 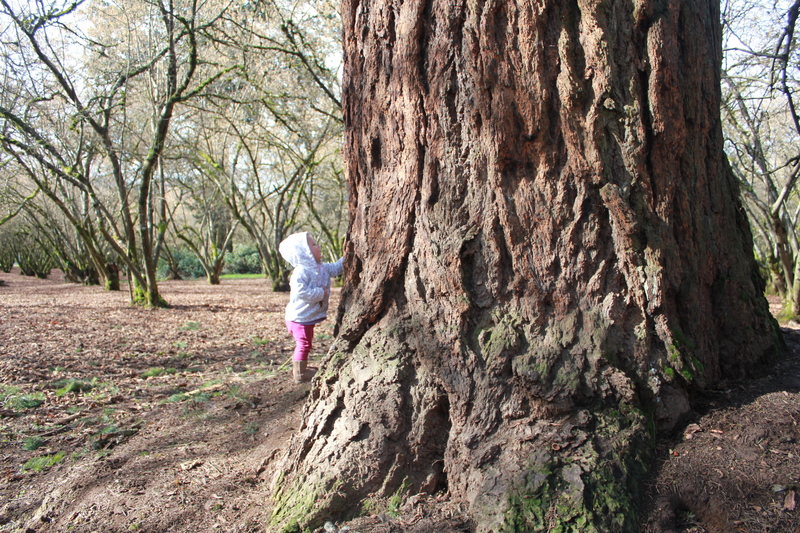 And what a fantastic picture of her in front of that redwood! Oh Dr. Alice. How I loved, and truly needed, to hear this from you. It is far too often that I opt for the “strap the kid into a carrier” option. Your patience is a gift to watch and experience and I do hope that we can go for a walk together again soon. Their pace. Not ours. Lots of love to your family on this crisp, beautiful day. I would love to take a walk with you and your kiddos again, Julia! I think BabyC’s pace is a little slow for your boys still, but she doesn’t mind riding for part of it. Hope you are all getting happily settled in your new home. Let’s get together soon! Congrats! You have so much to look forward to! I love that motherhood continues to open new ways for me to experience the world! Great post on the need to slow down and follow the lead of the child! I love your description of the scientific process for toddlers! Thank you! 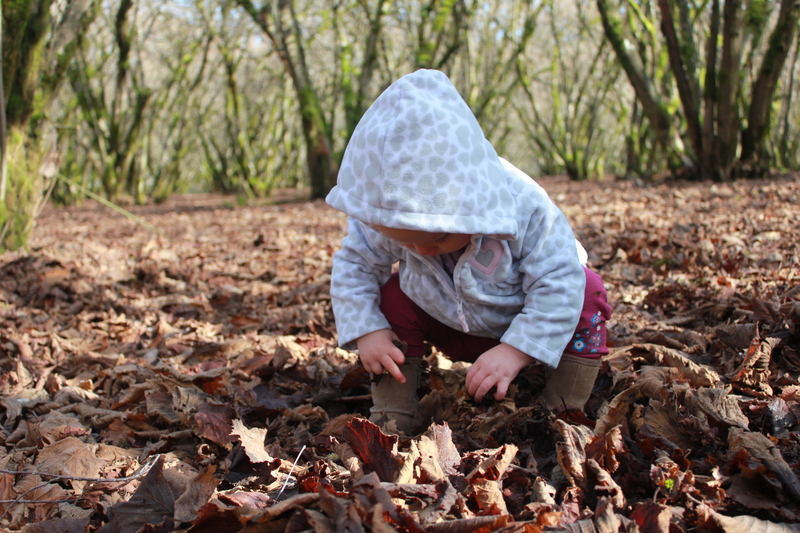 Thinking about my toddler as a scientist helps me to appreciate her pace and work more! Thank you for such a wonderful article! I’m currently teaching an early childhood science methods course to baccalaureate students. Although our textbook focuses on preschool and primary students, many of my students teach infants and toddlers. I can’t wait to share this post with them!